Sorry I've been away. It has been crazy busy these last few weeks with the new semester starting. Last Friday, my Design and Governmentality course discussed Foucault's governmentality and Mitchell Dean's discussion of the concept. The students' reactions were interesting. They felt that the readings took the glamour out of the ideals of justice or democracy. They did not want them to be just "things". This is what I think is powerful about Foucault's concept of governmentality is that it forces you to address the materiality and thus reality of governance, which for designers, are the exact loci of potential change. As long as these ideals are just ideals, one feels less responsibility for making them real in the world. But if they are only as real as people's tangible experiences of them, you have to work to make it real and tangible for them through things, institutions, and practices. This notion of materiality has become very important to me as a force for social justice in particular. People like the idea of social justice but often fail to make it tangible to people. If it is not sensed, then does social justice really exist. Last night, Mohammed and I went to see The Last King of Scotland, a biopic about Idi Amin. Forest Whitiker's performance as Idi Amin was extraordinary in making the former dictator seem very human in spite of his inhuman treatment of people. As I look around at contemporary tyranny, two things that are common among all dictators are (1) the inability to trust the people around them and (2) the recourse to murder to establish a base of trust. According to Aeschylus in Prometheus Bound, "For somehow this is tyranny's disease, to trust no friends." If based on the movie we did an analysis of Idi Amin, he was deficient in many areas of trust. So perhaps instead of looking at people's congressional records or testing them for topical knowledge, we should give perspective leaders the trust test to avoid tyranny. Barack Obama has agreed to run for President in 2008. I feel supportive but worried. It is interesting because even he says that African Americans are the most skeptical because they feel protective of him. I think that is really it. But now that he has made the decision, I will try to support him. I got up this morning and listened to MLK's "I have a dream" speech. It is interesting because Solidad O'Brian, who is doing a special report on the King Papers, said that this part of the speech was done extemporaneously. He had put down is written speech and riffed on the vibe of the crowd. The entire speech is 16 minutes long, and the "I have a dream" section is the last 3 minutes. I think people are so inspired about this section because its about the ideal. The ideal society in which people love one another and judge one another with fairness and openness. They never discuss the other parts of the speech because those sections were about the reality of contemporary black life. Even when you discuss contemporary racial and ethnic problems, people want to hear the dream of hope, not the action plan for justice. So as part of my MLK celebration, I want to talk about the other parts of the speech: the bounced check, justice now, and coming long way. This section is one of the most pertinant to the contemporary black experience because by putting social justice in monetary terms it brings out the issues of economic justice. We may be able to ride buses and eat at lunch counters, but Blacks in the US continue to suffer from a deficiency of economic justice. We hang at the bottom rungs of all economic ladders. See Black profile from US Census. Download we-1.pdf Yet as Normal Kelly, author of Rhythm and Business is the notion of economic justice "a naïve concept in an aggressive capitalist society like America." But I think the issue of economic justice is the heart of the global fight against exploitation and oppression. Slavery existed because people figured out they could make money on the body and souls of other people. So the message of cashing in the bounced check of economic justice is one that still needs to be heard and the one the MLK was working on when he was assasinated. This section of the speech is probably my favorite because it addresses the underlying cause of my inherent impatience. People are always telling me to wait and to take the "tranquilizing drug of gradualism," yet I believe that the things that need to happen are 100-200 years overdue. Black Americans had to wait nearly 200 years for their freedom due to being asked to wait for the promiseland. Injustice continues because people are being asked to to wait for the promiseland. What I appreciate about this section is that he says that justice must come now and things cannot go back to business as usual. This section of the speech is when MKL is "keeping it real" about the struggles that not just blacks but all of us go through when there is injustice in the world. He talks about those coming from prisons and ghettos. He talks about needed to understand the "common destiny" between blacks and whites. It is by understanding the journey of suffering that makes the Dream necessary and a promise. So Happy Justice day!!! Let us seize reality so that our dreams of justice can come true. I just checked out the American Anthropological Associations Race site. As part of the AAA's outreach and what I would call rebranding, it addresses the historical, biological, and socio-cultural aspects of race. It is an amazing site and exhibit, part of which I saw at the AAA meetings. Coming from a Boasian tradition, my engagement with anthropology has been complicated by the way in which the field has dealt with issues of race and racism. This presentation of anthropological knowledge about race reaffirms my faith in the field. Addressed to a general audience, it is education and engaging. It dispels many of the myths about race without authoritatively presenting one right answer. The games/quizes are very effective in allowing people to question their assumptions about who is white or the various ethnic/racial categorizations across the world. The design of the site is easy to navigate, friendly, and very professionally done. I say go check it out. As I am preparing for an NSF, I am coming to realize that I am no longer a scientist (social). Growing up, I had every expectation to become a scientist. I loved chemistry, psychology, biology, physics, and even calculus. I fell in love with anthropology because of its mix of science and humanities. Yet, I was never a positivist, or I was a cynical one. I remember in physics class in high school when I was give an extra credit assignment of researching equations with imaginary numbers. I never loved physics more than those couple of weeks contemplating imaginary numbers. But the reason why I am no longer a scientist is that I operate at a level of complexity that is the opposite of the key empirical sciences of physics and chemistry. As a cultural anthropologist, I seek out the complexity and tangled interrelations of phenonmenon, whereas these sciences are very much akin to design in terms of seeking simple models of phenonmenon. I put together a project with over 200 variables, wheres for science you need to define 3-4 at the most. So I edit myself down to a managable model of science, longing to ensnare them in future complexities. 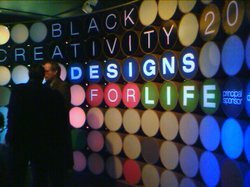 Last night, I attended the reception for the Designs for Life/Black Creativity exhibit as the Chicago Museum of Science and Industry. 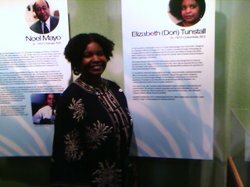 I was part of the exhibit of black design educators. It was really cool to see how many black designers there are. The majority of the exhibitors were working at Nike, Ford, Motorola, and other large manufacturers. I got to see black design pioneers Chuck Harrison and Noel Mayo again. I met lots of young designers who are doing very interesting work. Its strange because I feel like such a psuedo designer in those contexts or at least I feel compelled to position myself as a non-designer, maybe a design educator. I still must not accept the idea of being a designer, in spite of my extensive fine arts training or the fact that I can use the tools of, at least, graphic design somewhat effectively. But I am comfortable with being named a black creative, two identities, of many, which resonate quite deeply. The exhibit will be up from Jan 10th to Feb 28th. In November, there was the normal blog chatter about why designers are not involved with governance (or at least Bruce Nussbaum wrote about it in his blog). Beyond the exemplary work of UPA, AIGA, and STC (Society for Technical Communication) in this area, there are many opportunities in which design can have a significant impact in policy formation, the implementation of policy through messages, artifacts, and experiences, its evaluation, and redesign. But there is so much work to do in order to make it possible in terms of general awareness, the training of designers and researchers to tackle these problems within the great bureaucratic constraints, and the complexity and frustration of the democratic process. So hopefully getting on the word out about design to these groups is one of many steps in the “Design and Governmentality” awareness campaign that others and I have embarked on. The recent bombing in Spain seems to have derailed the peace process according to the NYTimes. The ETA, which was on its way to establishing peace negotiations during my GMF trip this past summer, are alleged to be responsible for the bombing that killed 19 people this week. Raids in Bilbao have uncovered stockpiles of bomb making equipment. Since Bilbao has come to represent real people for me (Paul Orgeta and Aitor Esteban), I feel the tragedy of the failure of peace very deeply. A student at UIC asked me what design anthropology was. She could not find the definition on my blog so I am posting my response to her. The use of anthropologically-based concepts and methodologies, especially ethnography, in the design process for new product and service design and innovation. This is what is promoted in Business Week when they discuss the uses of anthropology and ethnography in business. I look at it more philosophically. Anthropology seeks to answer the question, "What does it mean to be human?" Design anthropology approaches this question by seeking to understand how the processes and artifacts of design come help to define ever evolving ideas of what it means to be human. a) Archaeological studies of the origin of creativity and its contemporary evolutions. b) Human physical variation, ergonomics, and anthropometrics as manifested in the design of Nike tennis shoes. So its everything human as it relates to anthropology and design. It is sharing with designers the fact that anthropologists have studied the processes and artifacts of design for over 150 years, and that knowledge should be available to them to extend their creative conceptualization and execution to be more ethical. It is sharing with anthropologist the importance of form-making in communicating the value of human knowledge. How did you found out about Design Anthropology? How can I get into the profession? First, join the anthrodesign yahoo group list where people post internships and job announcements. Its rather difficult to find very entry level positions, but working at firms like Context Research, Adaptive Path, and Conifer will provide some experience. Make sure that you have a diverse set of skills in design as well as anthropology and maybe even marketing. It is an interdisciplinary field which requires a broad set of skills, yet deep core competency in either design or anthropology.